Welcome to The Mary Mary and JFK section. Select the tabs below to learn more about Mary Mary and JFK. The book release status will keep you posted on news and updates, Read chapter one from Part 1 and 2 Now! and start a conversation about Mary Mary when you see this link.. My Blog / Mary Mary and JFK enjoy the read Michael. Dustin forever changed my understanding of the word courage. They were born three years and four months of one another, Jack on May 29, 1917 in Boston, Massachusetts, and Mary on October 14, 1920 on the Eastern Shore of Maryland. Both families were a part of the deep rooted social elite of the north-eastern United States. Being a part of the north-eastern social, economical, and political inner circle, along with Jack’s and Mary’s good looks, sexual free spirit, and, of course, fate, set the course for an eventual sexual affair that endured for a period of twenty-two months within the White House, up to the very day of the tragic assassination. Mary Pinchot-Meyer was the only one of Jack’s other women that Jackie, on record, insisted that he “get rid of”. With Mary and Jackie being old friends, Jackie was only asking that Jack rid himself of Mary as a lover; although Jackie, and others, could see that there was far more to Jack and Mary’s relationship than that of a usual Kennedy sexual fling. This important date marks the 49th anniversary of the assassination of JFK. 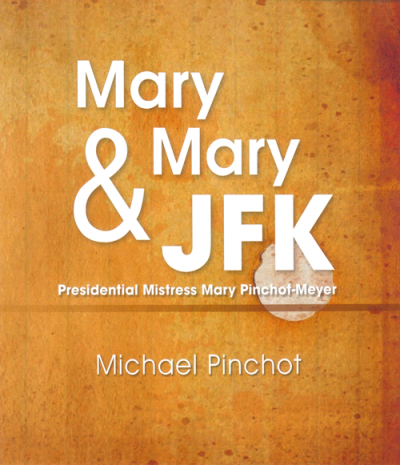 This tab will keep you posted on the current status and news regarding my new book release, Mary Mary And JFK.
! ! ! BULLETIN ! ! ! GREAT NEWS: I’ve been assured by my publisher that “MARY, MARY and JFK” will be on the street by no later than 11-1-13….the 1st day of the 50th anniversary year (month) of the JFK assassination.